The awesome thing about it is that you make it in advance, and then BAM, it’s just right there waiting for you when you are. Cacao butter is the pure, cold-pressed oil of the cacao bean, raw cacao butter consists of healthy fats including essential omega fatty acids. Cacao has been studied for its ability to reduce blood pressure and as a stimulant that can improve mental alertness. Raw cacao also contains great levels of magnesium, which is an essential mineral during times of stress and helps you to feel more relaxed. It also contains manganese, zinc, calcium and potassium and even decent levels vitamin C! Walnuts are known as a superfood because they contain exceptionally high amounts of long chain polyunsaturated (LCP) fats, which are crucial to optimize fat metabolism. 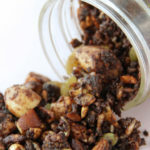 For this reason anyone who is dealing with high cholesterol can reap many benefits of adding 10 walnuts a day to their daily diet .They also have one of the highest concentrations of the plant source of omega 3 fat alpha-linolenic acid (ALA), which has anti-inflammatory properties and contributes to good heart health. Unlike highly refined sweeteners such as white sugar and corn syrup, which lack nutritional value, blackstrap molasses provides a range of vital minerals including calcium, potassium, manganese, iron, and magnesium. The iron in molasses is particularly beneficial for plant based eaters, menstruating women and anyone dealing with anemia. Get your Crock Pot ready by turning it to Medium. Add cacao butter (or coconut oil) and allow it to melt. Add in molasses and almond butter. Once melted add cacao powder, vanilla powder and salt, whisk until well combined. 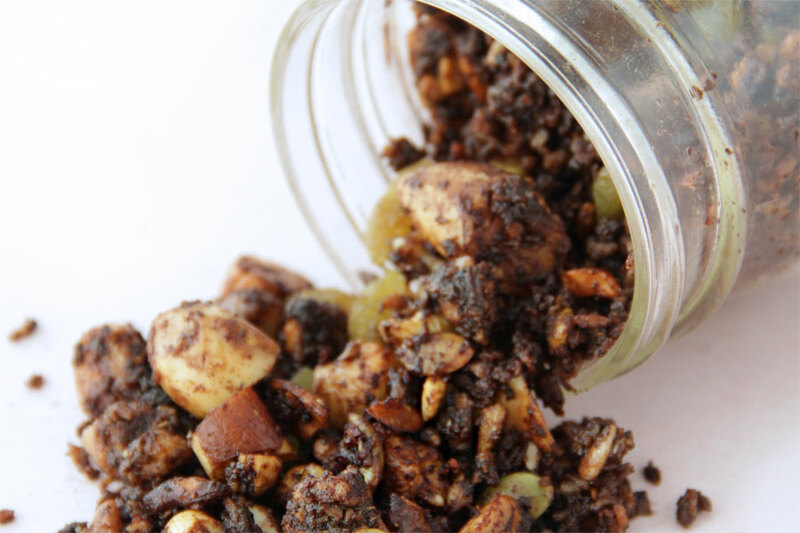 Stir in nuts, seeds and coconut, making sure all ingredients are well mixed and coated. 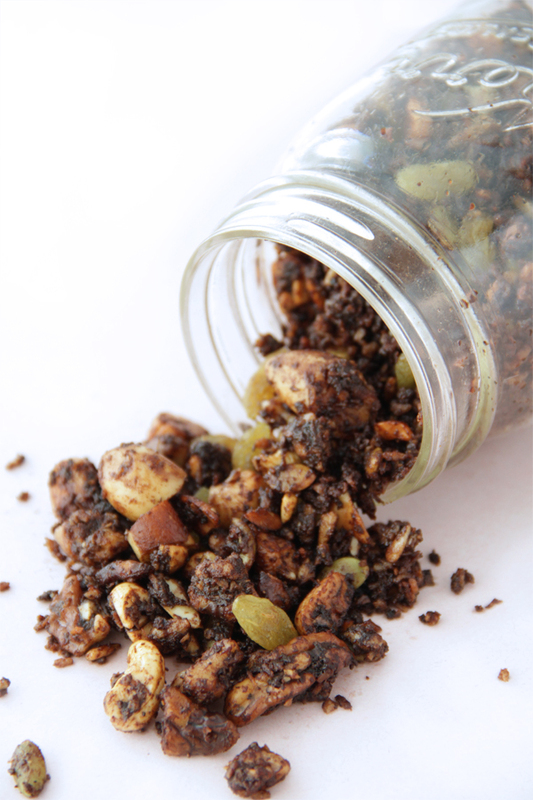 Cover and cook the granola for 1 hour, or until crunchy, gently stirring every 20 minutes to prevent the granola closest to the edges from burning. 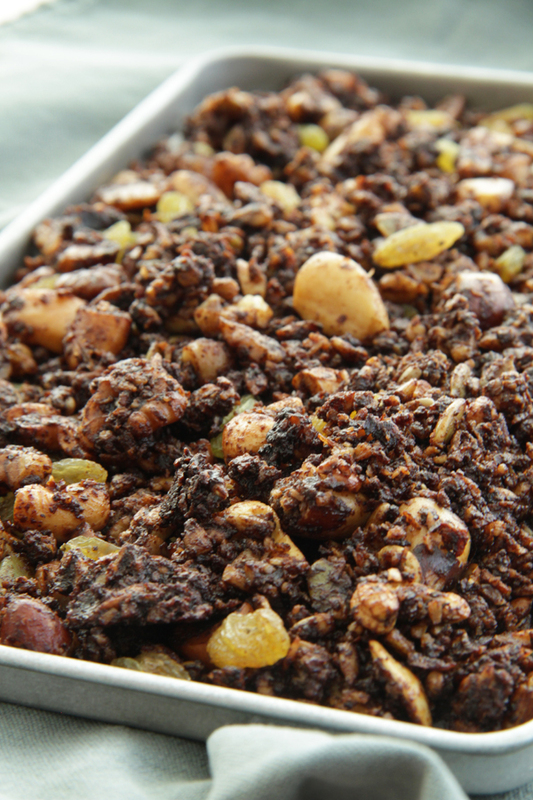 Once the granola finishes and reaches your desired crunchy texture, transfer it to the prepared baking sheet, mix in raisins and allow to cool completely. Transfer into a grass jar or container and refrigerate. Store in a closed glass container. Will keep in a cool dry place/fridge for up to 2 weeks.